How do I determine when my Macbook pro was manufactured? I have an early 2011 17" Macbook Pro which is giving me issues related to SATA 6.0gbps; these issues were apparently consistent with the first machines off the line but some of the later machines have been better. I bought my first in March but fed up with the issue I went this week and bought another - alas - same issue. How can I determine the manufacturing date of the machine? I'm always hesitant to recommend an app to do what a terminal command could do... but I cannot for the life of me find the terminal command to output the date of manufacture of any given Mac. I recommend the free app coconutBattery for this task. 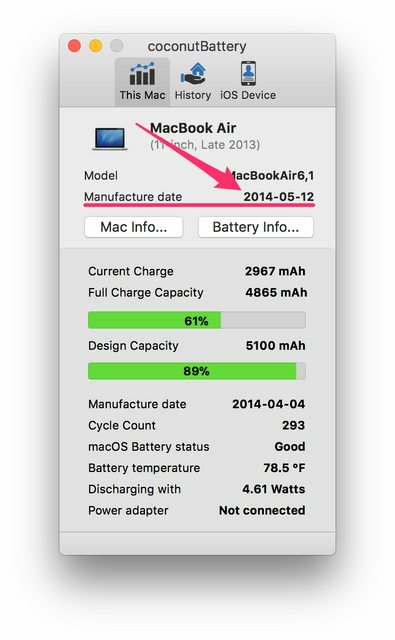 It's a battery health monitor, and it happens to also show the date of manufacture of the Mac that it's running on. brew cask install coconutbattery (if you use Homebrew) or download from the developer's site. Try the official support page at Apple for determining your MacBook model. Hope this helps. This web service can give you information about the date your Mac was manufactured. You just input your serial number. 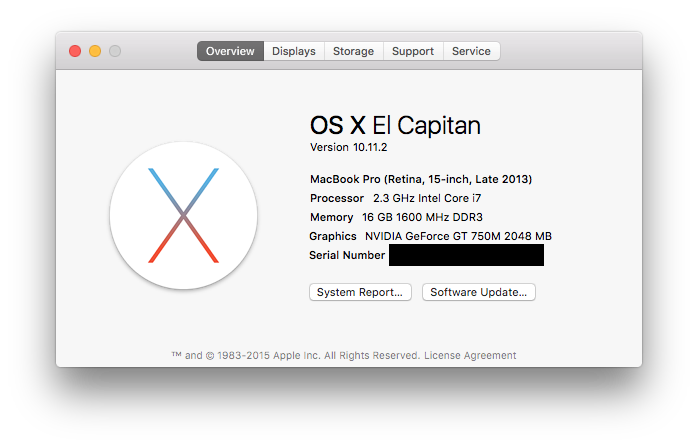 You can find the serial number by going to the Apple menu > About this Mac. The Serial Number is the bottom of the list. Macrumors.com also has an interesting article about the information encoded in Mac serial numbers. The serial number of an Apple product has (almost always) the manufacture date encoded. For a CPU, first two characters of the serial number is the factory code, next three are the year (one digit only), and week. So, for my MacBook Pro, the serial number "WQ929xxxxxx" indicates the twenty-ninth week of 2009 as the date of manufacture. The format could change, of course, but this has been the pattern for years. Under the Apple menu, "About This Mac" can be selected, to show the serial number, or you can hunt the case of an iPad or iMac for a label. In case of a repair and motherboard replacement, the software might no longer know that serial number. I've had good luck asking at the genius bar or Apple Care online. They've been able to help me determine manufacture date. How to check when Macbook was turned on first time? How to disable the SpeedStep when using MacBook Pro without a battery? MacBook Pro “clicking” while muted when showing a message dialog in Windows on Parallels - what's happening?